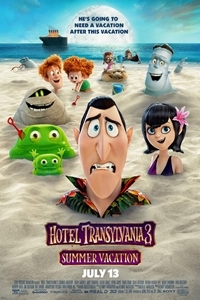 In Sony Pictures Animation's Hotel Transylvania 3, Mavis surprises Dracula with a family voyage on a luxury monster cruise ship so he can take a summer vacation from providing everyone else's vacation at the hotel, and the rest of Drac's Pack cannot resist tagging along. The monsters are all having a great time, indulging in all of the shipboard fun the cruise has to offer, from monster volleyball to colossus sized buffets and exotic excursions, but then the unexpected happens as Drac falls for the intriguing-yet-dangerous captain of the ship. Balancing family, friends, and a budding romance might just be too much, even for the most powerful vampire.